We've almost got another year in the bag, so it's time to take a look back at all that went down throughout 2015 in the world of heavy metal. This was an uneven year featuring both highs and lows, and metal didn't escape the drama frequent in other styles of music at all in the last 12 months. Echoing previous schisms in famous black metal bands, Immortal finally took its turn imploding and split into two, and this was probably the worst year in recent memory for U.S. metal tours. On the flip side of that, a solid number of amazing albums saw release, and metal also catapulted to the top of the charts with some major releases that made people outside the underground take notice. After two solid years dominated by reunions and reboots, it looks like that craze is finally winding down. This year most notably we saw the return of Faith No More with “Sol Invictus,” but on the more underground end industrial black metal outfit Diabolicum also came back with a first album in 14 years. Although not quite on the same scale of time, Arcturus finally returned with a new full-length after a decade's waiting. While there are less surprise reunions announced for the coming year, there is one classic outfit hitting the road to take note of, as Black Sabbath's “final” tour - dubbed The End - runs through most of 2016 across the globe. While we wait to see what's in store in the coming year, first we'll look back at everything that went down throughout 2015. Both Slayer and Lamb Of God ended up topping the charts with their latest albums (with Lamb Of God even getting nominated for a Grammy). It's not often a metal album hits #2 in the world, but Slayer managed to do it. While not everyone loved the album, the exposure alone is good for the genre overall. But how was the more underground metal? Simply put: pretty killer, if you knew were to look. There was a solid mix of great albums from long time bands like Amorphis, Cattle Decapitation, Enslaved, and Soilwork, as well as excellent material from newer and less prolific groups like Alkaloid, Tribulation, and Lychgate. The tried and true classic outfits from Cradle Of Filth to Iron Maiden to My Dying Bride made appearances, and there were some seriously ambitious undertakings (Swallow The Sun released a TRIPLE album). A handful of bands that were already solid managed to really outdo themselves with stellar material this year though, including Subterannean Masquerade, Code, Shining, and Melechesh. We'll start on the bad with a universally panned album: Geoff Tate's "The Key" with his Operation: Mindcrime band (reviewed here). It didn't go over well with just about anyone, and its clear which half of the split with Queensryche to pay attention to in the future. Vying in the category for “most unlistenable” was Liturgy, who just had to show up and ruin music for another year. The number of outright bad albums was actually pretty low, however, but we made up for it as 2015 will forever be known as the year that nearly every tour spectacularly failed. Most recently European tours took a hit following that horrific terrorist attack in Paris during an Eagles Of Death Metal show, with some bands deciding to pack it up and go home, while others put on their big boy pants and kept on touring (and kudos to you guys). Earlier in the year, the Metal Alliance tour absolutely imploded, with both Entombed A.D. and Lorna Shore getting booted from the bill, resulting in a Deicide headliner. The whole thing caused so much negative fan reaction it inspired Deicide to claim the band won't be touring the U.S. in the foreseeable future. The Civil Unrest tour also got really, really ugly with when Otep accused a member of Terror Universal of sexual assault, and both bands were subsequently dropped from the trek. The usually reliable Summer Slaughter tour then took a beating when both After The Burial and Obscura dropped off the bill. This year's Prog Power USA festival suffered from similar problems as several bands had to drop off the lineup due to visa or health issues. What will probably be the most remembered touring catastrophe of the year was Mayhem Festival, which was marred at every possible point by both poor ticket sales and constant in-fighting between the bands and organizers. Everybody pointed the finger at everybody else, and things got so bad that a certain other metal site (known for its sensationalist clickbait headlines) decided to preemptively declare the tour was dead and done forever. We'll have to wait until next summer to see if that turns out to be an accurate prediction, but there's no question Mayhem Festival has a serious black eye and will need to work hard not to repeat that train wreck. But now that all that's out of the way, let's get on with the show – here's what we loved most in metal this year! Landing in the middle of the year, “The Plague Within” (reviewed here) offered an excellent and satisfying blend of old and new as Nick Holmes brings the goods on the vocal front. If you miss Paradise Lost of yore, this is an album that needs to be on your radar. The votes were close though, and several bands are worth mentioning that just barely lost out. Blind Guardian's “Beyond The Red Mirror” vied strongly for the top spot, as did the latest releases from Tribulation and Napalm Death. As is usually the case with our year end awards, what we voted as most anticipated last year – the new albums from Slayer and Faith No More - didn't come close to winning best album this year. In an interesting twist, absolutely none of our contributors even nominated either Lamb Of God or Faith No More, and Slayer's “Repentless” was only nominated by one person. Clearly we didn't follow the crowds or the charts, as none of the biggest releases of the year got much love from our contributors. 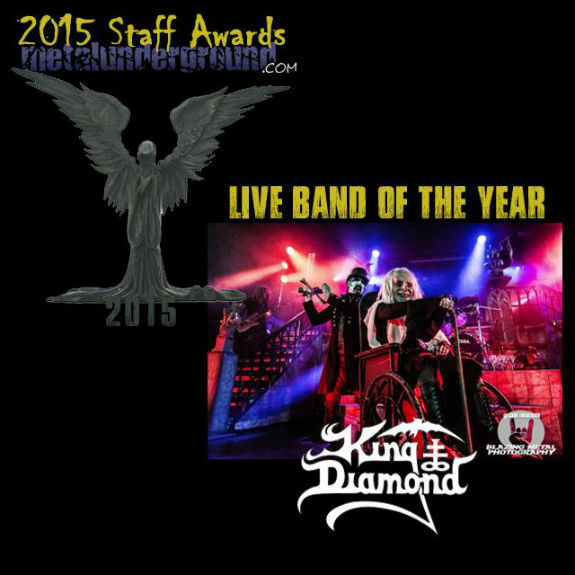 King Diamond – two years in a row! There's no question the King puts on a hell of a show. He only took home the award by 1 single point though, as we also loved what Behemoth had going on with live shows this year. Other bands that put on impressive shows and were nominated by our staff included Sigh, Alice Cooper, and Riot. Obviously we didn't hit every show that went down across the world though, so let us know what YOUR favorite live performance of the year was! Devin returns to the top after winning back in 2013 with “The Retinal Circus” as well. Any Townsend show is guaranteed to be bonkers, and adding Ziltoid to the experience is just going to up the wacky factor. If you haven't seen this one yet, you really should, or at the very least check out the clips on YouTube. Going in a completely different direction, our two runner ups were Katatonia's mostly-acoustic “Sanctitude” as well as the “Full Circle” DVD by Pagan's Mind. Every year there's a new crop of metal talent that arrives to show the old dogs how its really done. Sometimes these are composed of established members of the scene, but frequently they are young and hungry bands ready to make a name for themselves. Gruesome took it home by a mile, as the modern day reinterpretation of Death's sound clearly resonated with metal fans. That wasn't the only band to release excellent debut material though, as the next runner up was the criminally underrated and unknown prog death metal band Alkaloid, followed in third place by traditional metal act Visigoth. For a deeper look at some of our nominated newcomers, check out music from our top 5 picks right here. 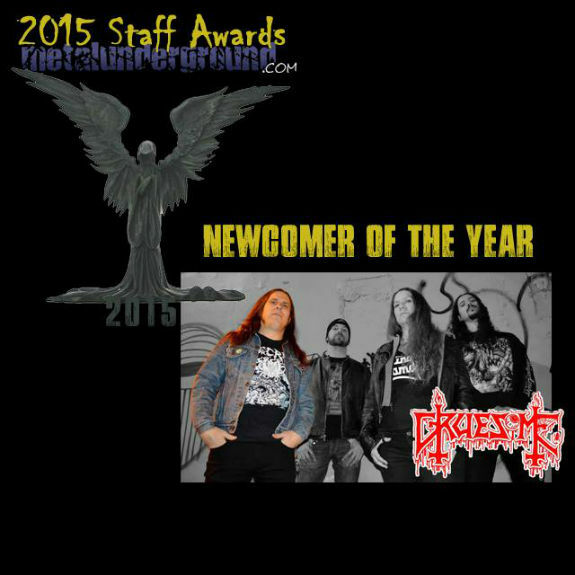 Following closely behind were our three main runners-up: Obscura, Testament, and King Diamond. It's worth noting that absolutely no one voted Metallica, despite the new album in the works, and only one person nominated Dimmu Borgir. It seems like metal heads have given up hope on either of those releases actually arriving or being any good. 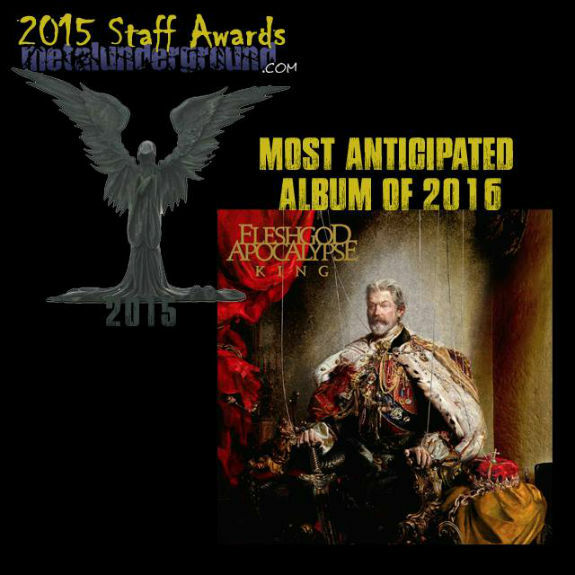 Last year (2014) was the first time ever that we had the most anticipated album from the previous year actually nab the best album award the following year, with Behemoth's stellar “The Satanist.” We'll have to wait and see if Fleshgod Apocalypse can make that happen again next year. What do you guys think are the chances we'll vote it best of 2016? 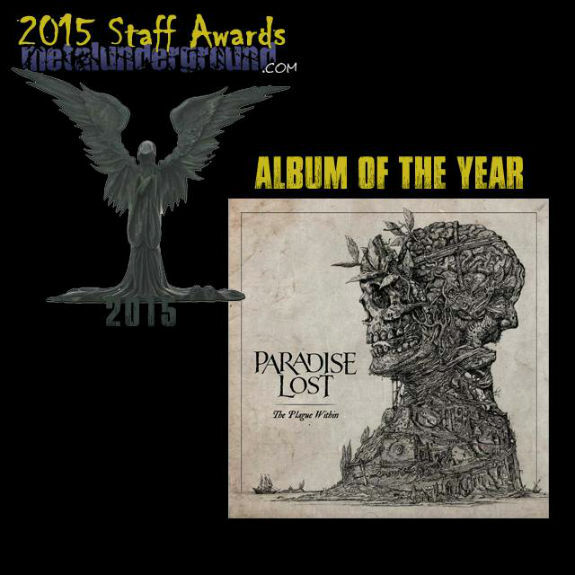 15 Comments on "The Best And Worst Of Metal In 2015"
Paradise Lost for the win! I actually didn't vote for the Paradise Lost album, but after seeing all the other votes come in for it I went through and listened again and it is a really great album. Just due to personal preferences its still not my album of the year, but there's no question it's a great one if you dig the style. Killer picks all round! I didn't vote for PLs album either strangely enough but it *was* a great one by them, had a lot of friends raving about it so congrats to them. Stoked for Gruesome though! Man I've had so much fun with their Savage Lands album, they're proud of what they're putting out and nail it. I can only hope they put out something new and add something new to the formula - in great memory of Chuck! KING PARROT and GRISTNAM, check these guys out. My most anticipated album of 2016 has to be the new SUPERJOINT "ritual"
More than Gruesome, for me the best newcomer was Alkaloid. "The Malkuth Grimoire" was a killer album, but it didn't get as much press since they went it alone without a label backing it, even though it had guys from Obscura, Blotted Science, and Dark Fortress. Yesterday's Saints AOTY for me! Moonspell's "Extinct" is the best album for me. Behemoth, as always, is the best live band (with King Diamond a close second though. Also agreed on Alkaloid. Devin's DVD was also a worthy winner. I got it as a Christmas gift from my lovely wife and have enjoyed the he|| out of it. His supersized V guitar was killer. Still waiting for my Alkaloid CD. Youtube will suffice for a little while longer. UDO had the best cd of the year. I have most of the cd's of the groups mentioned and hands down UDO was the best followed by Lamb of God and Slayer. Come on guys, stop forgetting about UDO. Damn, they put out the best heavy metal year in and year out and hardly ever a mention.